John and Sarah bought their property on a beautiful block in St Andrews in the Kinglake Ranges, Victoria, overlooking a neighbours vineyard and with plenty of kangaroos for company some years before Black Saturday in 2009. 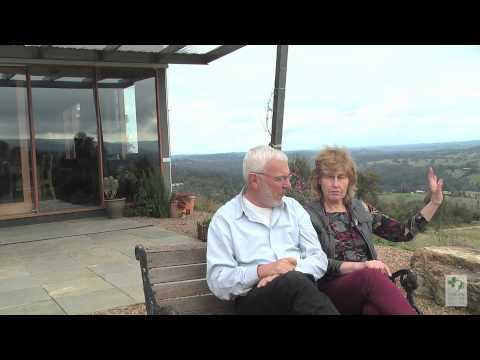 Even before the fires, John and Sarah had planned a bushfire resilient home for the property. However, the events of Black Saturday enforced to them the importance of resilient and environmentally efficient building. In this process, they benefitted greatly from the local knowledge of their neighbours and Country Fire Authority advice. John and Sarah's home is also environmentally friendly and energy efficient, with PV panels on the roof and solar hot water. Thanks to careful consideration and planning, Sarah and John have an incredible home that is both environmentally friendly and resilient - in a beautiful part of the world. Read the full story on Build it Back Green.